Isle of Man, a British Crown Dependency in the Irish Sea between the islands of Great Britain and Ireland has a total land area of 221 square miles and a population of over 80,000. Mann, as it is known, is a self-governing British Crown Dependency that was never part of the United Kingdom. The island's parliament which dates from AD 979 is Tynwald, is said to be the oldest continuously existing ruling body in the world. The three legs in its motto stands for 'Whichever way you throw it, it will stand'. Offshore banking, manufacturing, and tourism are the major sectors of the present economy. Agriculture, dairy, and fishing were the earlier mainstays – Manx lamb and cheese are still preferred by gourmets. The best time to visit Mann is from June through September. Though Isle of Man is essentially a place to unwind, it has its share of ruins, castles and tours to hold the interest of its visitors. Diving, sea kayaking, marine life watching are all possible here. Manx government is actively courting the film industry to shoot in its beautiful locale by contributing to the production costs. The national dish is Spuds and Herrin (boiled potatoes and herring). Cuisine is mostly seafood and cheese based. Walking on the Isle of Man: 40 Walks Around the Island 978-1852843991 $15 The guide includes 40 walks, great color photographs, and a historical introduction and coverage of flora and fauna for travelers. The first stamps of Isle of Man were a set of seven stamps released between 1958 and 1969 showing a Queen Elizabeth II portrait along with the Manx Emblem. The set (Scott #1 to #7) catalogs for around $3 MNH and around half that for used. This set along with a sister set (Scott #8 to #11) released in 1971 were both classified as British Regional Issues whereby they were sold only in the Isle of Man, but could be used anywhere in Great Britain. The latter set is also very affordable cataloging for less than two dollars for MNH or used. The former set used the Wilding’s design and the latter has the Machins design paralleling the Great Britain issues from the period. The Manx Emblem, the Triskelion (three bent legs, each with a spur, joined at the thigh) is the island’s symbol also called The Legs of Man. The first original issues of Isle of Man were a long set of sixteen stamps released on July 5, 1973 showing local scenes. The set (Scott #12 to #27) catalogs were around $10 MNH or used. The designs show Castletown and Manx Emblem, Port Erin, Mount Snaefell, Laxey Village, Tynwald Hill, Douglas Promenade, Port Saint Mary, Fairy Bridge, Peel Castle and shore, Cregneish Village, Ramsey Bay, Douglas Bay, Manx Cat, Manx Ram, Max Shearwaters, and Viking Longship. A set of seventeen stamps released in 1978 showing Landmarks. The set (Scott #113 to #129) catalogs for around $10 MNH or used. The designs show Government Buildings, Tynwald Hill, Milner’s Tower, Laxey Wheel, Castle Rushen, Saint Ninian’s Church, Tower of Refuge, Saint Germain’s Cathedral, Point of Ayre Lighthouse, Corrin’s Tower, Douglas Head Lighthouse, Manx Cat, Crows, and Viking Warrior. Viking theme is quite common in Isle of Man stamp issues – the Viking Settlement in the Isle of Man began around the 8th century and continued until 1266 when it was ceded to the isles of Scotland, per the Treaty of Perth. A long set of sixteen stamps released in 1983 in the Birds theme. The set (Scott #224 to #239) catalogs for around $12 MNH or used. The designs show cranstal puffins, gannets at Point of Ayre, lesser black-backed gulls of Santon, cormorants of Maughold Head, kittiwakes of White Strand, calf of Man of Shags, herons at Douglas Foreshore, herring gulls of Peel, razorbills of Calf of Man, shelducks of Poyll Vaaish, oystercatchers of Langness, Arctic terns of Blue Point, guillemots of Calf of Man, redshanks of Langness, and mute swans of Port Saint Mary Bay. A set of ten stamps released on February 18, 1994 in the Tourism theme. The set (Scott #577 to #586) catalogs for around $7 MNH or used. The designs show Galety Theater at Douglas, games events, yacht racing along with a hand painted picture of castle, TT Motorcycle Races, Red Arrows demonstration squadron, musical instruments, Laxey Wheel and Manx Cat, Tower of Refuge, cyclist, Tynwald Day classic racing car, and Santa Claus Riding Mince Pie Train. TT Motorcycle Races also called Isle of Man Tourist Trophy race or simply “The TT” is an international event considered to be one of the greatest motorcycle sporting events of the world. It takes place end of May for two weeks. A set of six stamps released on February 21, 2004 showing famous Steam Locomotives of the World. The set (Scott #1022 to #1027) catalogs for around $10 MNH or used. The designs show Maitland, Evening Star, Penydarren Tramroad Locomotive, Duchess of Hamilton, City of Truro, and Mallard. The set reminds one of the extensive steam-operated narrow-gauge rail system the island used to have. Currently there are just three lines primarily for tourists – a steam railway between Douglas and Port Erin, an electric railway between Douglas and Ramsey, and an electric mountain railway to Sanefell. There are almost 700 miles of good paved roads on the island which, along with the government bus service made the steam railways redundant over time. 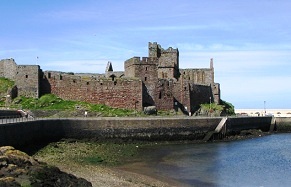 The first coins of Isle of Man were privately issued pennies by John Murrey in 1668. The ‘Murrey Pennies’ depicted the ‘triskeles’ symbol and that tradition continue to present day Manx Coinage. The first Government Issue was introduced in 1709. Copper Farthings (quarter of a penny) debut in 1839 (14 Manx Pence = 1 British Shilling). Isle of Man did not issue coins between 1864 and 1970. It converted to decimal coinage in 1971 when half, 1, 2, 5, 10, and 50 new pence coins were introduced. Since the 1970s, a large number of gold and other commemorative coins are issued every year, primarily for numismatists. Coins $1 and up Recent UNC Pennies start around $1. Recent Commemorative proofs start around $10. Colored Proofs from the 2000s start around $20. Silver proofs from the 1980s onward starts around $40. Gold coins start around $100 and go well into the 1000s for proof sets. Bullion $50 and up Silver Bullion Proofs starts around $50. Platinum and Gold Bullion Proofs start well into the 100s. Paper Money $5 and up Common UNCs from the 1980s onward starts around $5. High Values, First Polymers, Bundles, Low numbers, etc can go well into the 100s. Cheese, confection, soaps, and watercolor are among the main buys by visitors. Art $10 and up Maps, posters, and 18th century photo prints start around $10.